The Football Team Credit Card/Money Leather Wallet is a perfect present for any dedicated football fan. A fantastic way to show their allegiance to their team, as well as a great practical gift. The wallet has department for ID, cards and notes and is made from leather with the team’s embroidered club crest on the front. 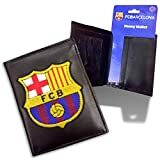 This Football Credit Card/Money Leather Wallet is an Official football product and is produced under licence for the respective club. This entry was posted in Barcelona and tagged Barcelona, Card/Money, CREDIT, Wallet by Footy Star. Bookmark the permalink.